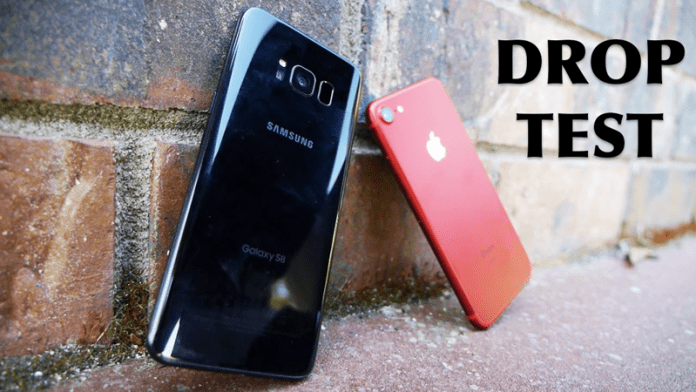 Samsung Galaxy S8 & iPhone 7 Drop Test! Guess Who Is The Winner? Do You remember YouTuber TechRax, who very often posts videos performing various stunts? Recently, YouTuber TechRax has given new meaning to the term “Drop Test” by dropping an expensive Samsung Galaxy S8 and iPhone 7. Do You remember YouTuber TechRax, who very often posts videos performing various stunts? Recently, we have seen TechRax throwing iPhone 7 Plus off the world’s tallest building. We have also seen few drop tests from TechRax too! However, what about watching a drop test video of latest Samsung Galaxy S8 and iPhone 7? Let me tell you, both are high-end premium smartphones. Recently, YouTuber TechRax has given new meaning to the term “Drop Test” by dropping an expensive Samsung Galaxy S8 and iPhone 7. Well, TechRax not only performed the drop test he also tortured Galaxy S8 which is little painful to watch. Both the phone was dropped from a height of 25 feet. The Galaxy S8’s glass was instantly destroyed while the iPhone 7 plus survived the test. However, Samsung Galaxy S8 features a bezel-less “infinity display” which turns out to be more durable than iPhone 7’s screen. Well, both the screen was cracked and shows clear signs of damage. However, the end result shows that Galaxy S8’s screen was more durable compared to iPhone 7 Plus. TechRax had even shared a video which shows that S8’s screen was more durable as it could withstand more blows from a hammer and looked considerably less shattered.